Do you find the world a fascinating place? How many worlds are there out there? There are so many amazing things going on in the world, so many facts to learn and so many mysteries to solve. So join my Worlds of Fascination for a articles on everything from the profound to the trivial, the odd to the mysterious. Halloween in the 21st century is a party night of grinning Jack O'Lanterns and kids in costumes going out ‘Trick or Treating’. It is now very much a commercial event, with costumes, make-up, Halloween sweets and pumpkins being sold. But here in Great Britain the origins of Halloween are much older and go back to ancient times. As the summer fades into a memory, the harvest has been brought safely in and the nights grow colder our Celtic ancestors celebrated the great feast of Samhain. For the Celts, the year was divided into two seasons which were marked by two great festivals. Beltane, celebrated on 1st May ushered in the light season and Samhain marked the beginning of the dark season on November 1st, the first day of winter. In ancient times, winter was a time of stillness and waiting, a time where little new work could begin and survival depended on the success of the summer harvests. The animals would be brought down from the high pastures either to be slaughtered and salted for winter use or to be sheltered in stables during the bad weather, firewood would be chopped and stacked, and crops would be stored and fruits preserved. Bonfires were traditionally lit on Samhain and sacrifices and votive objects were thrown into the flames to ask for blessings, seek answers to problems or plead for the healing of a sickness. These bonfires were lit, especially in Scotland, as recently as the early part of the 20th century. People would dance around them, light torches from them, and run around the fields so that parish boundaries would be surrounded with a protective circle of light. The bonfires are still lit in Britain at this time of year, but now it is mainly on the 5th November to commemorate Guy Fawkes and his Gunpowder Plot to blow up the English Parliament in 1605. 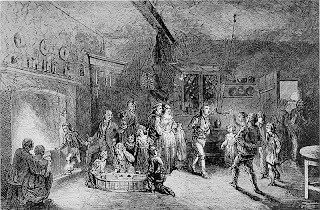 The 5th November is known as ‘Bonfire Night’ and effigies of men known as ‘Guys’ are made and dressed in old clothes, mainly by children, who then sit with their ‘Guy’ and ask passersby for a ‘penny for the Guy’. The money is traditionally used to buy fireworks and the Guy is placed on the bonfire as it’s centrepiece before it is lit. The fireworks are then set off while the bonfire is burning. There is also an old rhyme that was chanted ‘Remember, remember the fifth of November, gunpowder treason and plot, I see no reason why gunpowder treason should ever be forgot...’ Poor Guy Fawkes paid a heavy price for his crime as he was hung, drawn and quartered, which in those days was the penalty for treason. In Ottery St Mary in the county of Devon, there is a custom which dates back to 1688 where on 5th November men run through the streets of the town carrying flaming barrels of tar around on their shoulders until they can no longer bear the heat or the weight. Another man then takes over, and then another, until the barrel starts disintegrating and is left to burn itself out. Earlier in the proceedings there are smaller boy’s and women’s barrels and, as the evening goes on, the barrels get bigger and heavier. One of the most sought after souvenirs is one of the metal rings from a burnt out barrel. The custom started as a pagan cleansing ritual, designed to clear the town of evil spirits. An alternative theory is that the burning barrels were used in shops as a form of fumigation. As Christianity came to Britain, the old customs were not forgotten or given up. The churches of this new religion were often built on sites that had been used for many centuries for pagan ceremonies and worship. The new churches were given new names, new religious rites were practiced but the old customs were continued. 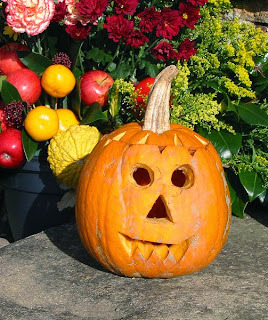 The feast of Samhain was changed to All Saints Day or Hallowmas and the 2nd November was celebrated as All Souls Day. All Saints Day honoured all of the saints in heaven and All Souls Day was a day when prayers were said for all the souls in Purgatory who were waiting to be forgiven. So the 31st October became known as All Hallows, Hollantide in Wales and the Isle of Man or what we in modern times call Halloween. In Cornwall the 31st October was known as Allantide and was connected to a little known Cornish saint called St Allen or Arlan. One of the customs of Allantide was the giving of large, highly polished apples. They would be given to family members as tokens of good luck and teenage girls would put them under their pillow in the hope that they would dream of the person that they would marry one day. There was also a game played where pieces of wood were put together to make a cross and then suspended with four candles attached. The Allan apples would then be hung under the cross and you would have to try and catch an apple in your mouth. If you were clumsy or not quick enough you would be punished by the hot wax from the candles dripping on you. Indeed apples feature very heavily in Halloween customs and dunking apples or apple bobbing is a widespread game that is played on this night. Apples are placed in a large tub of water and players have to get the apples out using only their teeth and with their hands behind their backs. A variation of this is where doughnuts or sticky cakes are suspended from a string and eaten, again without the use of hands. Another method of divination to find out who your future spouse was going to be was to peel an apple in one strip, toss the peel behind your shoulder and see what letter of the alphabet was formed when it landed. This letter was believed to be the first letter of their name. It was also believed that if a single girl sat in front of a mirror in a darkened room on Halloween the face of her future husband would appear in the mirror; if she were due to die unwed the image of a skull would appear instead. The Ancient Celts also believed that on the eve of Samhain the veil between the world of the living and the dead became thinner and that the dead could wreak havoc among the living by causing sickness or ruining crops. Masks and costumes were donned to mimic the spirits and perhaps to pacify them. In Scotland young men would blacken their faces and dress in white. The Celts would also put skeletons by their windows to represent those who had died. They also believed that the head was the most powerful part of the body as it contained a person’s wisdom and spirit, so they would carve a lantern from a swede or a turnip that represented a head and light these on Samhain Eve. These came to known as Jack –o’-Lanterns after an Irish legend where a man called Jack the Smith encountered the Devil when he was drunk and managed to trap him up a tree. To gain his release the Devil granted Jack’s request that his soul would never be taken to Hell. When Jack came to die a few years later, he was denied entry to Heaven because of his previous drunken lifestyle and so went to the gates of Hell. Due to the promise that the Devil had made, however, he was not admitted there either but was given a glowing ember to carry with him in a turnip to light his way and brand him as a soul who belonged in hell. It is believed that he forever roams the night, not welcome in either the world of the living or the world of the dead. So as you see, there is a lot more to Halloween than a horror film on the television and too much candy. It is a night that is steeped in tradition and was a significant night in the spiritual beliefs of our ancient ancestors. A night perhaps where it would be better for you to curl up cosily under your duvet, for who knows who or what you might encounter if you go wandering alone the swirling mists and darkness? 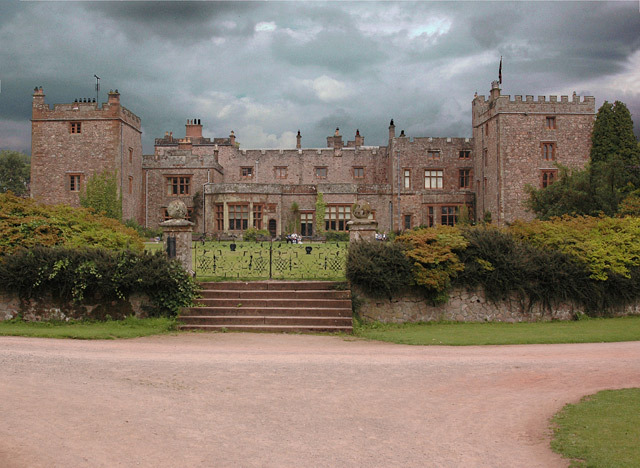 Have you ever visited the ghosts at haunted Muncaster Castle? Britain has a very long and often bloody history, with a landscape that is scattered with many historic buildings and monuments. So it is not surprising that many of these historic stately homes, castles and old churches are reputed to be haunted; reputedly being regularly visited by phantoms from the ghostly realms. The region known as the Lake District, in the North West corner of England, has had an especially turbulent past. Close to the Scottish border, armies have marched through this wild, mountainous area scattered with lakes since Roman times, to try and subdue the warlike and turbulent Scots north of the border. It is even said that the Ninth Roman Legion that disappeared in the second century AD, was lost in the Lake District; their remains still lying out there somewhere waiting to be found. Of the old stately homes and castles in the area, Muncaster Castle is possibly the most haunted old building in the whole of the Lakes. Castra is the old Roman word for fort or military encampment and current archaeological work in the area of Muncaster Castle is beginning to suggest that there was indeed once a very large Roman Fort in the vicinity of where the castle now stands. There are also the fairly extensive ruins of an old Roman Baths just a few miles away in nearby Ravenglass, so the Romans were definitely living and working in the area. Muncaster Castle has been occupied by the same family, the Penningtons, since around 1208, a tenancy that has currently lasted for over eight hundred years. Muncaster is a very beautiful castle, which is still in very good condition. It is open to the public, offering what is called ‘The Muncaster Experience’. In the castle itself, you can explore the unique Octagonal Library, the vast dining room and Great Hall. All of the rooms are full of antiques, paintings, tapestries and interesting historical objects. Outside there are seventy acres of glorious gardens to wander through, including the Muncaster Himalayan Gardens, containing many rare species and a large collection of rhododendrons. The castle grounds are also home to the World Owl Centre, which houses one of the largest collections of owls and birds of prey in the world. But however attractive and interesting the interior of the castle and grounds are, it is Muncaster Castle’s ghostly visitors that fascinate us the most. Paranormal investigators and scientists have been investigating the ghostly goings-on in and around the castle since 1992 without being able to come up with any rational explanation for the hauntings. These include Jason Braithwaite of Birmingham University who is a neuroscientist and cognitive psychologist who believes that there are ‘strange and anomalous magnetic fields’ in the areas of the castle where the hauntings are reputed to take place. One of his theories is that these strange magnetic fields might affect the brain functions of certain people, such as those who suffer from epilepsy and migraines, which causes them to experience these apparently paranormal phenomena when they are within range of the magnetic field. One of the most famous haunted rooms at Muncaster Castle is the infamous Tapestry room. It was discovered that the Tapestry Room had previously been used as a children’s nursery and visitors staying overnight report that they have heard children crying. One theory is that the crying child is the ghost of Margaret Susan Pennington who died at a young age of screaming fits in the nineteenth century. The walls of the Tapestry Room are adorned with sombre paintings and there is an iron fire dog in the shape of the devil in the fireplace. Moreover, the mattress of the bed in the Tapestry Room lies on a sheet of chain mail. Guests staying the night in the room have also heard a woman singing, disembodied ghostly footsteps, doors swinging open of their own volition and the feeling of hands touching them in the night or even throwing them from the bed. Probably the most famous ghost of Muncaster Castle is that of Tom Fool, who was a sixteenth century jester. His real name was Tom Skelton and he was reputedly the last court jester in Britain and a friend of William Shakespeare. His ghost has a reputation for playing jokes on people he takes a dislike to or that he believes are threatening the Pennington family. Tom Fool also had a very dark side, as it is said that he murdered an apprentice carpenter by hacking off his head while he was asleep. He had been bribed into committing this dastardly act by Lord Ferdinand Hoddleston of Millom Castle. Apparently the hapless apprentice had committed the crime of falling in love with Sir Alan Pennington's daughter Helwise, who was Sir Ferdinand's promised bride and the lovers had enjoyed a secret tryst at the May Day Fair. The grief stricken woman retired to a convent and the ghost of her poor apprentice lover is now said to walk the halls of the castle at night with his severed head tucked neatly under his arm. This is not the only murder that Tom Skelton has said to have been involved in. 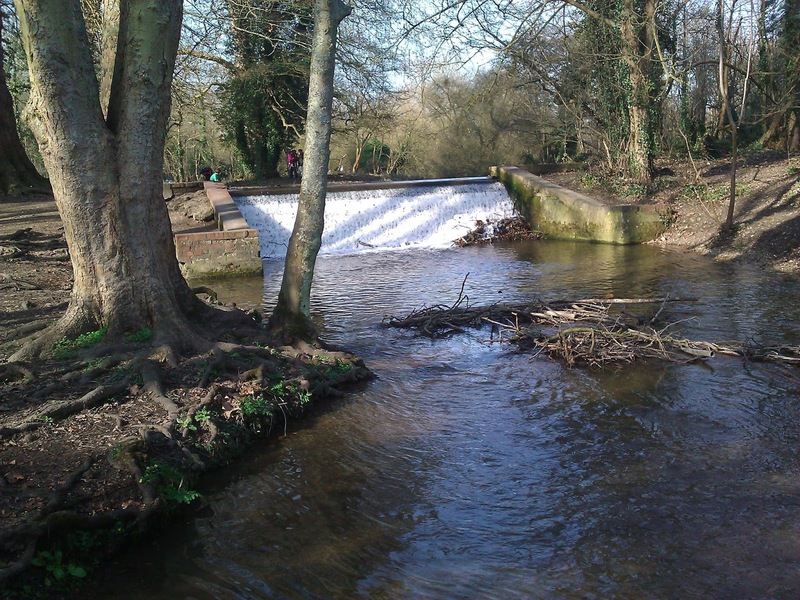 It is believed that when travellers asked him the best way to get to London, he would point them in the direction of the treacherous quick sands of the area where they perished, rather than to the relevant ford over the river. Tom Skelton died in or around 1600 and Muncaster Castle has a special day every year called ‘Tom Fool’s Day’ in his memory. You can still see his portrait hanging on the castle’s walls. 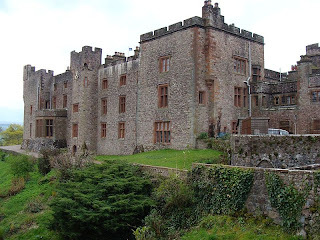 Another of Muncaster Castle’s famous ghosts is The Muncaster Boggle or White Lady. This apparition is thought to be the ghost of a young woman called Mary Bragg who was murdered in 1805. There seem to be several versions of the story of her murder in existence. One was that she had been a young local girl who was prone to swearing, who was hanged from the castle’s main gate by a group of drunken men after they had kidnapped her for a joke. In another version of the story, she was a housekeeper at the castle and unfortunately fell in love with a footman who was also greatly fancied by one of the housemaids. It is claimed that one night two men called at the castle saying that Mary’s lover was ill and that they would take her to see him. Instead of taking her to her lover, they took her to a lonely road and killed her. Her body wasn’t found for some weeks, eventually being found floating in a badly decomposed state in the Esk River. It is said that her head had been partially eaten by eels. It is also claimed that a tree near to where Mary met her fate started to bleed when it was cut down. Her lonely wraith haunts the grounds and roads around Muncaster, so be careful of who you may meet if you dare to walk those roads after dark. Muncaster Castle also boasts a royal ghost. King Henry VI was said to have hidden here at the time of the War of the Roses after the Lancastrian defeat at the battle of Hexham in 1464, and that his ghost still walks through the shadowy passages and rooms at night. To show his gratitude to Sir John Pennington for giving him refuge, Henry VI gave him an elaborate enamelled drinking bowl in white and gold known as the 'Luck of Muncaster'. The defeated Lancastrian monarch blessed the bowl and promised that the Pennington family would prosper as long as it remained unbroken. There is also a ghostly lion that is said to roam the castle and grounds, and is heard growling gently at dusk. This lion was supposedly shot by the last Lord Muncaster in Kenya and the lion’s skull is still kept in the castle. So if you want to experience the creepy atmosphere and haunting of Muncaster Castle for yourself, you can book a ‘ghost sit’ for up to six people to stay overnight in the truly spooky Tapestry Room. Other events and conferences are often held so hopefully you will get the chance to investigate and, experience its paranormal activity for yourself. Are you a tree lover? Before there were so many people, before there was an industrial revolution and mass farming, the British Isles and most of Europe was covered with trees. Vast, dense forests covered hundreds of square miles and our ancient ancestors venerated some of these trees as gods, believed some of them could be used to heal their bodies and even that some of them were unlucky or evil and had to be appeased. Even in our modern world, many of us find the idea of venturing alone into a deep, dark wood daunting and many horror films and books, such as ‘The Blair Witch Project’, centre around something dark and terrifying lurking in the shadows deep in the heart of the forest. And who didn't listen to the fairy tale of ‘Hansel and Gretel’ when they were young, where the two little children laid a trail of breadcrumbs through the woods to find their way home again? So it is not perhaps surprising that there are many myths and superstitions about trees that have been passed down from our distant pagan past. And when Christianity arrived and started spreading across Europe, the ancient beliefs about trees were not forgotten, but were incorporated into the new religion’s beliefs, and many trees came to be regarded as Christian symbols and had new myths attached to them. In Britain before the coming of Christ, the gods, spirits and elements were worshipped in groves of sacred trees by the Druids. The three most sacred trees were thought to be the oak, the ash and thorn, and this triad was attributed with great powers and magical properties. It was thought that guardian spirits inhabited the trees, and our saying ‘touch wood’ comes from the old custom of gently touching a tree to show your respect for the spirit that dwelt within in it and to ask for healing, blessings and favours. In ancient Greece, there was thought to be a type of nymph called a Hamadryad that was eternally bonded to their own tree. If that tree was felled or destroyed, the tree’s resident Hamadryad was also thought to die, so the Greek gods severely punished any mere mortal who damaged a sacred tree. Because they are very long-lived, trees were also regarded as a symbol of immortality, fertility and the never ending cycle of the seasons. Their longevity was a promise to our ancestors that life always renewed itself, and they would have known that many generations of their people would have met and worshipped under the shady branches of the same tree. This gave these leafy, shaded spaces a numinous quality, which allowed the echoes of the past to ripple into the present, providing continuity; a thread that bound them both to their ancestors and to the generations to come, so that wisdom and knowledge would never be lost. Trees were also an important source of fuel for their fires, building materials for their homes and provided fruit and berries for both food and medicine. When Christianity arrived in Europe, it seamlessly absorbed much of the mythology and the beliefs that surrounded pagan tree worship and turned it into Christian stories and legends. Indeed, the very first story of this new religion involves the first man and woman, Adam and Eve plucking a forbidden apple from the Tree of Knowledge and the redeemer Jesus Christ being sacrificially slain on a cross made of wood. 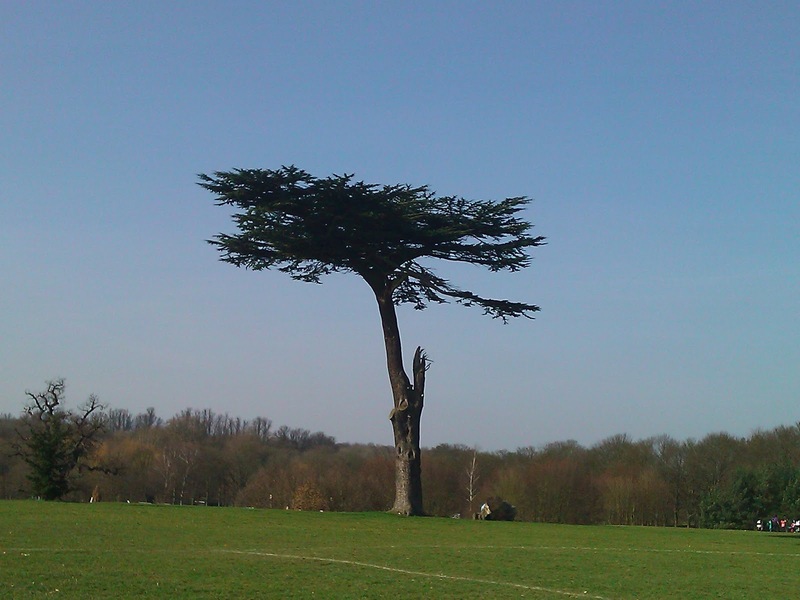 So what are some of the myths and superstitions associated with certain trees? Oak trees were probably the most important, magical tree in European pagan mythology. They were worshipped in sacred groves by the Druids and individual oaks were venerated. As they can make wailing, moaning noises when they are cut into or felled, they were thought to have human traits. Oaks possessed powerful magic that could cure you of your toothache if you drove a nail into the trunk, could stop you from ageing if you carried an acorn in your pocket and offered you protection from lightning strikes. Oak was associated with Zeus and Thor, the powerful pagan male gods of storms and lightning, and, because of their shape, were regarded as symbols of male virility and power. It is a good thing that oak trees offered protection from lightning, as they are more liable than other trees to be struck, partly because they are often the tallest object in the immediate landscape, but also because oak wood has low resistance to electricity. But being struck by lightning was also important to the oak tree, as sacred mistletoe was thought to have been left in the branches during lightning strikes. Oak leaves were used as symbols of power, conquest and military expertise, and Roman military leaders used to wear crowns woven from oak leaves during their victory parades. There are many famous, historic oaks in Britain that have had their own stories and legends woven around them. Perhaps the most famous of them is the oak tree that stands in the grounds of Boscobel House in Staffordshire, where in 1651 the future King Charles II hid after the Battle of Worcester to escape from Oliver Cromwell’s men. 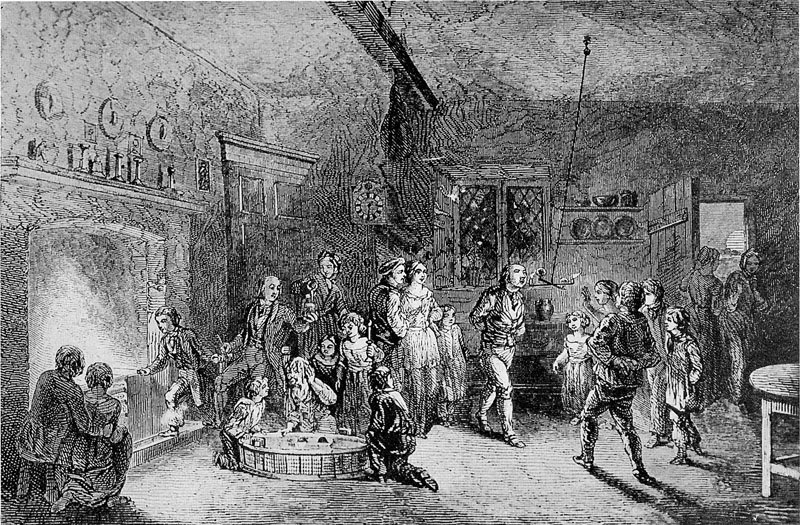 The day of his restoration to the throne, 29th May, has ever since been celebrated with feasting, singing and dancing as ‘Royal Oak Day’ or ‘Oak Apple Day’. It was traditional on this day to pin oak leaves or oak apples to your clothes and if you saw someone who was not wearing any then you were allowed to physically punish them with a sly pinch, slap or kick. There is also a legend that Elizabeth I first heard about the death of her sister Queen Mary and her accession to the throne while she was standing under the oak that stands in the grounds of Hatfield House, which has ever since been called The Queen Elizabeth Oak. Another famous oak stands in Windsor Great Park, where legend has it that one of the keepers, known as Herne the Hunter, hung himself from one of the branches. Herne had rescued Richard II from being gored by a white hart, but sustained mortal wounds while he was doing it. He was healed by having the white hart’s antlers attached to his head by a mysterious stranger called Philip Urswick. Unbeknownst to him Urswick had struck a deal with the other keepers in Windsor Great Park, and after he healed Herne lost his position. In desperation he hung himself from a large branch of the oak, where his swinging, antlered corpse was spotted by a pedlar. By the time the pedlar had returned with the other keepers, Herne’s body had disappeared and that night the great oak tree was struck by lightning. When the keepers returned to the oak at midnight they were confronted by Herne’s ghost who compelled them to ride with him forever in his Wild Hunt. Ash is another tree that was once thought to possess magical powers. If a child was suffering from a hernia or rickets, it would be taken before the sun rose to be passed naked through a split in the trunk of an ash tree. The split would then be bound back together, sealed with clay and left to heal. As the trunk healed, the child would miraculously recover from its ailment. Ash was also used to heal lame animals by carving a hole into the trunk and placing a live shrew inside it. The hole would be sealed over and when the shrew died and the ash healed, the lame animal would come sound again. Ash faggots were traditionally burned in hearths at Christmas. They would be bound together with green twigs, and as the ash burned you could make a wish every time one of the twig bindings snapped open. The single girls of the household would each choose one of the twig bindings, and if you had chosen the first one that burst open in the flames then you would be the first of the girls to get married. Ash trees were an important part of Norse myths, because Yggdrasil the World Tree was a mighty ash that grew in the centre of everything and spread out into everything, as its roots grew down into the dark mysteries of the underworld, its branches shaded every part of the world, and its trunk grew so tall that it penetrated heaven itself. Yggdrasil was the sacred place where the Norse gods would come to sit in council and where Odin hung himself in sacrifice, losing an eye when the ravens pecked it out. Hanging from a sacred tree is a continuing theme in tree mythology and one that carries on into Christian belief, as Jesus was nailed and hung from a tree to make his ultimate sacrifice for the sake of humanity, enabling their redemption. This symbolism is carried on into the modern tarot where the Hanged Man card drawn in a reading suggests sacrifice, limitations and a time of waiting. Yggdrasil was also associated with nurturing and abundance, as a miraculous goat that grazed at the foot of the trunk produced mead from its udder rather than milk, and this potent alcoholic beverage was served at the great feasts held by the gods in their Great Hall. Mead is made from honey and water, and this association with the ash tree may have come from the fact that some species of ash found in the mountains of Greece and in Northern Europe ooze a sticky, sweet substance that is a bit like honey. Yggdrasil was also said to rain honey down from the skies for the sustenance of mankind below, so this miraculous ash could truly claim to be the tree of life. Mountain ash is also known by the name rowan and is commonly found growing in Northern England, Scotland and Wales. It is another tree that offers you great protection for your household and can protect you and your family from witchcraft and evil spirits. It was used to protect and help farm livestock, as milkmaids used to tie rowan twigs to their buckets so that the milk would not sour and wreaths woven from rowan twigs were put around pig’s necks to fatten them up faster. Mares and cows would be fed rowan berries while they were giving birth, so that their labour would progress smoothly and the baby animal be born alive and healthy. Hawthorn with its glorious white blossom is the tree that is associated with the return of the sun after the winter and the month of May, so much so that it is also known as the May tree. The traditional maypoles that were set up on village greens to help celebrate the first day of May were often made from hawthorn wood and it was also used to make the garland that was used to crown the chosen ‘Green Man’ of that summer. In pagan times hawthorn was very much associated with fertility, passionate love and marriage. But the rise of Christianity saw the symbolism change as the white colour of the flowers were linked to purity and the Virgin Mary, to whom the month of May was dedicated. Probably the most famous thorn tree in Britain is the ancient one that grows in the Somerset town of Glastonbury. The Glastonbury Thorn was said to have sprung from the staff of Joseph of Arimathea after he stuck it in the ground and it only flowers once in May and once during the Christmas season. Joseph of Arimathea was said to have carried the Holy Grail with him as he travelled, and hid it away somewhere in the British Isles where it still lays waiting to be discovered. Tradition also has it that the crown of thorns that was placed on Jesus’ head was made from hawthorn wood. Hawthorn could also be used to protect your home from ghosts, witches and storms, by having the branches placed across the rafters by a person who was not a member of your immediate family. Bundles of hawthorn twigs were also hung outside cowsheds to ensure that the cows carried on giving an abundant supply of milk. However, it was thought to be very unlucky to bring hawthorn into the house, and if you decorated the interior of your house with it you could expect illness and death to swiftly follow. This could be because during medieval times people thought that hawthorn blossom smelled like London during the time of the Black Death. In fact, May flowers do contain a compound called trimethylamine, which is one of the chemicals that is formed in decomposing animal flesh, so would have given off a whiff of rotting bodies which would not been appreciated in someone’s parlour. Ancient yew trees can be found growing in many of the churchyards of rural Britain. They are a very long living species and can live for up to 1,000 years. In fact, the Fortingall Yew that grows in the churchyard at Fortingall in Scotland is thought to be between 2,000 and 5,000 years old. The trunk of the tree has split off into different offshoots over the years, so the true age cannot be determined by examining the rings within the trunk. Local legend has it that Pontius Pilate, the Roman Governor that handed Jesus over to be crucified, once played under the Fortingall Yew as a child and archaeologists think that it used to be the focal point of a local Iron Age cult. Because of their extreme longevity, it is therefore perhaps not surprising that yew trees symbolized immortality for our pagan forebears and that many Christian churches came to be built where sacred groves of yew used to stand. The yew also has what would have been viewed as miraculous powers of regeneration, as when one of the branches droops so low that it hits the earth, that branch can grow roots and start forming new trunks. Because of this link to a promised eternal life, in medieval times they used to line newly dug graves with yew branches to help guarantee the resurrection of the recently deceased soul. Yew is also one of the woods that traditionally have been thought to have been used to make the cross that Jesus was crucified on. This link with death may have come about as yew is also poisonous, and can easily kill a man if ingested in sufficient quantity. The yew was also believed to be able to protect churchyards from storms that had been conjured up by angry, vengeful witches. In the middle ages, yew was a favoured wood for making long bows; that ultimate weapon of the fighting man that was so vital to the English for gaining victory in battles such as Agincourt in October 1415. At that time archery practice with the longbow was enforced by law, and each man in England who was of an age to fight was compelled to spend time practising his technique and skills until they were deadly accurate. There were myths and superstitions surrounding practically every species of tree and they varied from culture to culture, even from village to village. It used to be thought that sawing up willow was very unlucky, so even very poor folk would not cut down the branches to use as firewood. But willow could also be very lucky if someone gave you a gift of willow branches on a morning in May. The poplar, also called the aspen, sometimes looks like it is shivering in the breeze. This was thought to be because its wood had been used to make the cross for the crucifixion and that the poplar was so traumatised by this that it still shakes in horror. People used to believe that if they suffered from tremors or shivering while they were ill, that attaching a lock of their hair to a poplar and chanting an incantation could cure them. The causes of disease were very poorly understood in years gone by, so folk thought that if they burned a fire of juniper wood during a plague epidemic that the resulting smoke would drive away the demons that were causing the terrible disease. If you dreamed of juniper berries you could expect the birth of a first male child, but dreaming of the juniper tree was a harbinger of bad luck. The elder was another tree that was a candidate for providing the wood that the cross of Jesus had been made from, so it also brought bad luck if it was brought into the house. Its unfortunate reputation was further bolstered by another tradition that Judas Iscariot, who betrayed Jesus at the Last Supper leading him to be universally reviled, had hung himself from an elder tree branch. Elder trees were also dangerous to approach during the hours of darkness, as witches gathered under them and if they caught you, then you could expect no mercy. So these are just a few of the myths and superstitions that are associated with trees. Across all cultures and in many different regions there are common themes of fertility, virility, the cycle of the seasons, protection, and great leaders sacrificing themselves by hanging themselves from their boughs to bring healing and renewal to their people. Trees are companionable, shady places to sit and dream under on a hot, sunny day, so the next time that you are sitting propped up against the trunk of your favourite tree, why not say hello to the spirit that lives there and give thanks to the tree for the healing and protection it gives you. What is Salt and Why Do We Sprinkle It on Our Food? What is Salt and Why Do We Need It in Our Diet? Luckily for us salt is one of the most common minerals on Earth and is formed mainly from sodium chloride. It is a crystalline solid and is white, light grey or pale pink in colour. It is an essential part of the diet for all humans and animals, as the sodium and chloride ions are necessary for our survival. It plays an important part in the regulation of the fluid balance of the body. Salt cravings can be caused by a deficiency of sodium chloride or by a lack of other trace minerals. 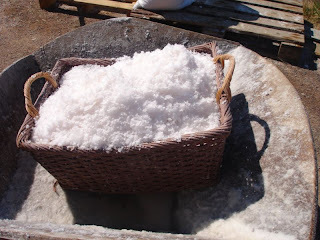 What we use on our tables today is produced in several different forms, in unrefined forms like sea salt or refined like table and iodized salt. It is also an important preservative and is used extensively to preserve food. The flavour is one of the basic tastes, making it one of the oldest and most commonly used seasoning. In the Western world traditionally there are four taste sensations: sweet, salty, sour and bitter. We lose salt from our bodies through sweating and excretion, so we constantly need to replace what we lose, especially in very hot weather. However vital salt is to us, having too much in your diet can cause you to experience health problems, such as high blood pressure, heart disease and an increased risk of stroke. Having too much in your diet can also cause water retention. Fully grown adults should eat no more than 6g a day, which is approximately a teaspoonful. And in the UK alone, reducing the average daily intake by adults could prevent around 17500 premature deaths a year. Children and babies need a lot less than this. A baby only needs less than 1g a day up until it is around a year old. Breast milk and infant formula contain the right levels, but it is important not to add it to baby’s food when they start eating solids and to not give them processed foods that are not specifically made for infants. Another benefit of reducing your salt intake is that you might begin to notice a broader range of flavours in your food. Much of what we consume is hidden in the food that we eat, so it is not just the salt that we add to our food that is the problem. Foods that have a high salt content are processed foods, bread, cereals, salty snacks and foods that have been canned in brine or preserved in salt. They should be avoided or cut down on where possible and replaced with fresh, home-cooked meals. Iodine is also commonly added to salt, especially in inland areas where there is little iodine in the soil for the crops to absorb. A lack of iodine in the diet can lead to problems with the thyroid gland in the neck known as goitre. In the United Kingdom this was commonly known as ‘Derbyshire Neck’ as it was a condition particularly prevalent among the poorer sections of society in Derbyshire, particularly young women of child bearing age, a century or so ago. It is believed that we first started adding it to our food when our early ancestors started cultivating crops in about 10,000 BC and started to eat less meat. Earlier, prehistoric hunter gatherers had derived all the sodium that they needed from the large amounts of meat and fish that they ate. They also discovered that you could use it to preserve food, so that they could store it at times when food was plentiful to be used when the food supplies were running low. Early civilisations learned that they could obtain it from dried out lakes, by boiling or evaporating sea water or mining in areas where solid salt forms in the ground. However, supplies remained scarce until modern times and for most of recorded history it was regarded as a rare and valuable commodity, due to the expense of extracting it and then conveying it overland or by sea. In Iran in 2005 a group of salt mummies were discovered in ancient salt mines. These were bodies of workers who had perished in the mines around 1700 years ago and whose bodies had been naturally preserved by the salt. Taxes on salt were introduced by the ancient Chinese and there were times when the revenues raised made up half of the Chinese Empire’s tax revenues. The Great Wall of China would probably never have been built without this tax! The Romans also taxed it and one of the famous Roman roads the ‘Via Salaria’ or salt road was built to transport it. The infamous French salt tax known as the ‘Gabelle’ was hugely unpopular with the French people. It was first imposed in 1286 by King Philip IV and was not repealed until 1790. There was also a long history of taxing it in India and the huge increase of this tax by the British which led to it becoming unaffordable for a lot of Indians was one of the issues that flared up and helped pave the way to Indian Independence. It is said that in ancient times, when an enemy was conquered, the victorious army would sow it into their fields so that they would not be able to grow their crops. The most well known example is the Romans ploughing it into the soil after they conquered Carthage in 146 BC, although this is disputed as it is not mentioned in ancient texts but is mentioned by the 19th century German historian Ferdinand Gregorovius. We still commonly use the term ‘above the salt’, which originated in the Middle Ages when a salt cellar was placed on the dining table and the important people of the household were seated above it and the lesser folk and servants were seated on the other side. The fact that it was expensive was shown by the fact that these salt cellars in prosperous households were often quite large, very ornate and made of precious metals. Other phrases that we still use are ‘salt of the earth’ denoting a person who is very worthy which reflects how precious it used to be. “Taken with a pinch of salt’ means that what has been said should not be taken too seriously and ‘worth one’s salt’ harks back to the custom of Roman Legionnaires receiving some of their wages in the form of salt. Spilling salt is still thought to signify bad luck and that it can only be countered by tossing some of what you have spilled over your left shoulder. It has to be the left shoulder, because that is where the devil sits. Toss it over your right shoulder and you will be throwing it into the eyes of your guardian angel. This belief may have come from the story that Judas overturned a salt cellar at the Last Supper and spilling some of the precious condiment over the table. It also used to be believed that salt, along with earth and fire could protect you from demons. It used to be placed in baby’s cots to keep them safe and a plate of salt would be placed on the breast of someone who had just died to prevent the devil from taking their soul. Finally, you would normally feel safe from a shark attack swimming in the fresh water of a river, right? Sharks live in the salty waters of the oceans, don’t they? Wrong! Bull sharks are considered by experts to be one of the three species of shark most likely to be aggressive to humans, along with great whites and tiger sharks. They generally live in shallow waters near the coast in tropical regions, but they are among the only sharks that can survive in brackish and fresh water. They have been spotted thousands of miles up the Amazon River, been caught 900 miles up the Mississippi River and leap the river rapids in Nicaragua to reach Lake Nicaragua which is inland. So that river you like to have a swim in might not be so safe at all! Join the Guided Tour of Greek Mythology! All aboard, all aboard! Please take your seats and make yourselves comfortable as we take an incredible journey around some of he key sites and locations that feature in the Greek myths. 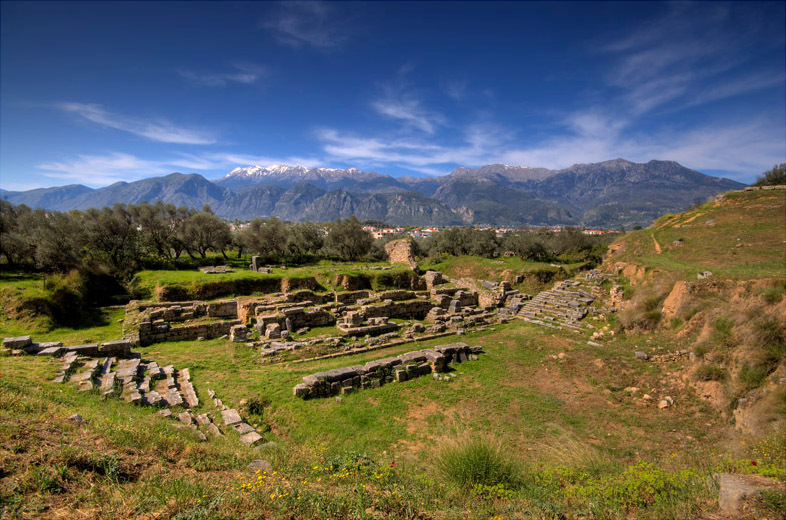 On this very special tour, not only will you get to relax and enjoy some amazing scenery as we travel through the Greek countryside, but you will also have some exclusive introductions to the gods, goddesses and heroes who played the crucial parts in these ancient legends. So please make sure that you have your seat belts buckled and your tables in the upright position and we will travel back over two thousand years to our first destination. And see how fast we have arrived out our very first destination, Ancient Sparta. During the classical period Greece was mainly comprised of independent city states, but what made Sparta stand out from the rest is that it was the only one that had a full time standing army and the Spartans gloried in war and physical fitness. Young boys were sent off to the army barracks for training at the age of seven and even the little girls were made to participate in sport and feats of physical endurance so that they could go on to have many healthy Spartan children when they grew up. In fact, in our day and age the term ‘spartan’ has come to mean harsh, austere conditions and living a life with few luxuries or comforts. The Spartan army was a disciplined, awesome fighting machine and was regarded with respect and fear throughout the classical world. Their most famous military engagement was the stand they took at Thermopylae in 480 BC. Along with a small force of Thebans and Thespians, they stood their ground against a much larger army of invading Persians, inflicting a huge amount of casualties before they were finally overcome. The founding of Sparta came about after the great god Zeus, King of Olympus indulged in one of his favourite pastimes and pursued a local nymph called Taygete, the result of which was a son called Lacedaemon. When he grew to manhood he founded the city of Sparta and named it after his wife. Probably the most famous citizen to have ever been born in Sparta was the legendary beauty Helen of Troy. The girl that was destined to grow into ‘the face that launched a thousand ships’ was another of the prolific progeny of the god Zeus, this time pursing the wife of the Spartan King Tyndareus, who was called Leda. Now Greek myths tend to have several versions, but it was said that as Zeus pursued Leda she turned into a swan. After he had made her succumb to him, she laid an egg out of which emerged the beautiful Helen. In some versions of this myth there were two eggs laid, one of which produced Helen and Clytemnestra and the other the heavenly twins Castor and Pollux. One dark twin and one light twin emerging from each egg. Now we have to wave goodbye to the beautiful Helen of Troy and the mountains of Sparta, although we will meet her again later on in our journey. It is time to take some refreshment and relax in the beautiful Garden of the Hesperides. Now you might be tempted to pluck one of the exquisite golden apples growing on the many apple trees in the grove, but we would advise you against this and would encourage you to stick with the packed lunch that we have provided for your delectation. 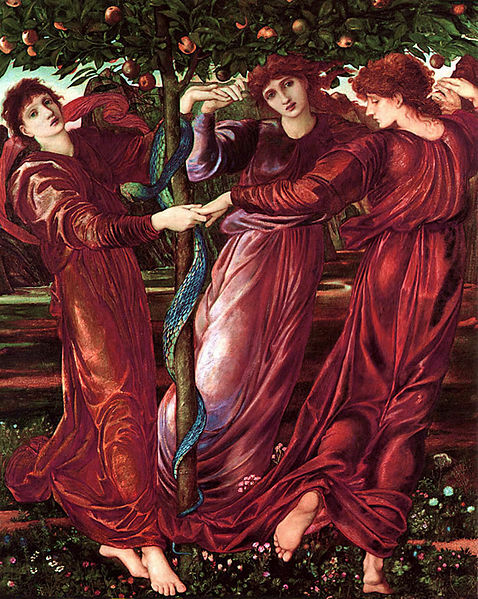 Although the garden is tended by the beautiful nymphs, the Hesperides, the golden apples which confer immortality on those that eat from them, are guarded jealously by a fearsome dragon with a hundred heads called Ladon. Please note that your travel insurance does not cover any injuries sustained while trying to pat the dragon. The garden is owned by Zeus’s long suffering wife Hera, and we are hoping that she will pop in while we are there to have a cup of teas with us and tell us some more about this fantastic garden and the problems that she is always having with her husband. One of the most famous stories is of the time when one of the golden apples was stolen and secreted out of the sacred grove. It was taken by the goddess of discord, Eris, who then had engraved on it ‘for the fairest’. Now the unpleasant events that were to follow the stealing of the golden apple, including the Trojan Wars, were all down to Eris’s nose being put out of joint because she had not been invited to the wedding of Peleus and Thetis. She secretly snuck into the wedding reception and rolled the engraved golden apple in amongst the revellers. On reading the inscription, three of the most powerful goddesses instantly claimed it as theirs. A un-deity like fracas broke out which had to be mediated by the all powerful Zeus, who decided that a handsome youth called Paris, who was a prince of Troy, would get to choose who was the most beautiful goddess. The three contenders immediately got their kit off, had a quick bathe in the Spring of Ida and proceeded to bribe the judge just in case he was not impressed enough by their naked beauty. Athena offered to teach him military skills and guarantee him prowess in war, Hera offered the young prince the chance to rule all of Europe and Asia, and the goddess of love Aphrodite tempted him with the possession of the most beautiful woman in the world. Being a typical man, Paris rejected the more practical offers of Athena and Hera, and tossed the golden apple to Aphrodite, bagging for himself the pulchritudinous Helen of Troy (told you we would meet her again!) in the process. Now there were a few little snags that he hadn’t taken into consideration when he made his choice, such as the fact that the gorgeous Helen was already married to King Menelaus and that it is never a good idea to get on the wrong side of two important goddesses. The Judgement of Paris was to prove another of the steps on the way to the Trojan War. 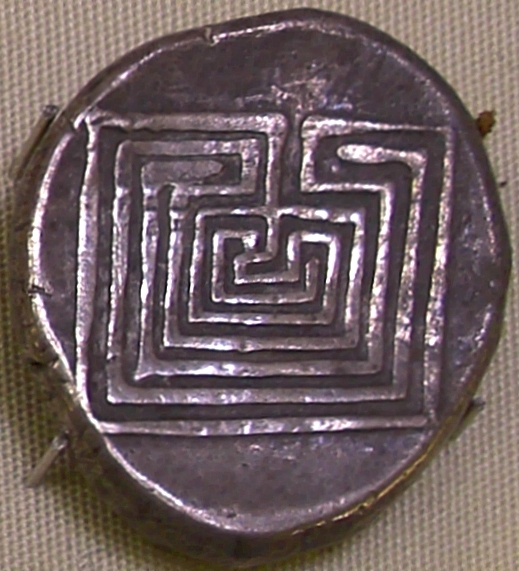 Now I am very aware that the tour so far has been a bit short on visitor attractions, so we are going to get some sea air and explore the legendary Labyrinth on the island of Crete. The price of admission was included in the tour price and we will give you several hours to see if you can find your way into the centre and then get out again. We have only lost seven tourists in the last three seasons, so we are very proud of our record. The mythical Labyrinth was constructed for King Minos by Daedalus to house the half-bull and half-human monster that was the Minotaur. Legend has it that the god of the seas, Poseidon, gave Minos a white bull to sacrifice. But Minos decided in his infinite wisdom to keep the white bull for himself, so to teach him a lesson Poseidon, with a little help from Aphrodite, fixed it so that Minos’s wife fell into lust with the white bull and several months later gave birth to the Minotaur. 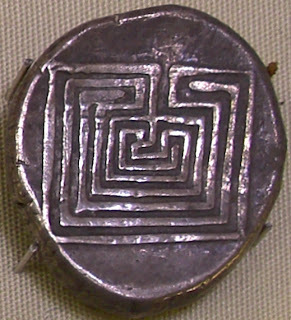 Now please note that the Labyrinth was built to a very complicated design and apparently even Daedalus had trouble finding his way out. Now to keep the Minotaur fed and watered, Minos demanded a tribute of seven brave young men and seven beauteous young girls every seven years from the city state of Athens. This was so that Athens could pay a suitably high price for assassinating King Minos’s eldest son Androgeus some years previously. The Greek hero Theseus decided that enough was enough and took over from one of the doomed youths so that he could go and slay the monster. Although he had been divested of all his weapons when he sailed for Crete he had managed to secrete his sword under his tunic, and fortunately for the dashing hero Minos’s daughter Ariadne slipped him a ball of twine before he was shoved into the Labyrinth. He tied the end of the twine to the door post and managed to find his way through the dark to its very centre, where the Minotaur lay sleeping. A tremendous fight ensued and Theseus eventually cut off the monster’s head. He followed the twine back out into the Cretan sunshine and took off with the Athenian youngsters that he had saved and Ariadne and her sister Phaedra. However, to show his gratitude to the Cretan princess he left Ariadne asleep on the beach on the island of Naxos one morning and then he forgot to change the sails of the ship to the white ones from the black ones as they approached Athens to signal that the youths were safe, so the poor old king committed suicide out of grief. Now we have to leave the beautiful island of Crete behind us as we embark on the Argo for a cruise through the Mediterranean to the Black Sea with Jason and the Argonauts. We are glad that in Crete you have had the chance to swim in Homer’s ‘wine dark sea’, but there will be many further opportunities for sea bathing as our cruise stops at the island of Lemnos, then Samothrace, and then through the Bosphorous into the Black Sea. On this cruise you can join Jason and his Argonauts in their quest for the fabled Golden Fleece that Jason needs to find in order to claim his kingdom. Now the Argonauts are a pretty VIP bunch, so you will be priviledged to rub shoulders with the likes of the son of Zeus, Pollux, the Greek hero Perseus who rescued the fair Andromeda from the sea serpent, and chat with the legendary Hercules, another son of Zeus, about his twelve labours. When the tour reaches the city of Aria in Colchis you will be given the chance to pan for gold using a sheep’s fleece, and will be given a souvenir grain of gold set in a tasteful plastic frame to take home with you as a treasured memory of your trip. The next stop is one of the highlights of the tour as we travel overland by luxury coach to the fabulous city of Troy on the coast of Turkey. Here you can choose which side you would rather be on, and join the siege of the city either on the side of the Greeks or the Trojans. The fair Helen enters our story once more, as to gain possession of the most beautiful woman in the world, our hero Prince Paris had to steal her away from her husband King Menelaus’s palace at Mycenae. With his pride and his honour severely dented, King Menelaus raised an army stuffed full of Greek heroes to go and reclaim his wife. As it was a long and tiring siege that lasted ten years, there will be optional tours of Achilles’ tent, lessons in how to deliver prophecies that won’t be believed with Cassandra, and workshops on how to build a Trojan horse. After a decade, you will be really looking forward to the grand finale when the great wooden horse is rolled through the gates of Troy and the Greek warriors leap out and fall upon the unsuspecting Trojans. We have to tell you, however, that at this stage of the tour your travel insurance will not cover you if you accidentally get run through with a sword or are hit by an arrow through the heart. And to show that all men are fools for love, when Menelaus reclaimed his wife after the death of Paris he fully intended to have her killed for her betrayal, but she somehow she managed to charm him all over again and he put off killing her until an unspecified later date. Now we had hoped to round off this tour with a very special, VIP trip to visit the gods on Mount Olympus. We even had Ares, Apollo, Hermes and Artemis lined up to give you exclusive audiences and photo opportunities with the deities. However, all is not lost as the god of the underworld Pluto and his gorgeous young wife Persephone have invited us to visit with them in Hades. You will get to enter Hades through the cavern at Avernus, and you will then be given a souvenir coin to put under your tongue to pay the ferryman Charon for the crossing of the river Acheron. On the far side of the river you will be given a few minutes for a photo opportunity with the three headed guard dog Cerberus and then you will be given plenty of free time to chat with the shades of the dead and find out what the underworld is really like. For a small extra fee, you can enjoy the whole abduction by Pluto experience, where we will leave you in a grassy meadow plucking flowers, and the dark lord of the underworld will spring out of the earth in his chariot and drag you down into Hades and feed you pomegranates. Now unless your name is Orpheus, Theseus or Hercules, we have some unfortunate news for you. Hades, like the Hotel California in the song by the Eagles, is somewhere you can check in but you can never leave, so make sure that you have packed enough for an extended stay. We would like to thank you for joining us on our exciting trip around Greek mythology and we would be very grateful if you could fill in our feedback forms and hand them in to your representative. As you are now a permanent resident of Hades, we have taken all the necessary steps to inform your relatives and wind up your earthly affairs. If you ever manage to find a Greek hero who is willing to bust you out from the underworld, we would be very happy if you choose to travel with us again. Have a nice day and mind how you go.